Enrique Lavezzi kicking the ball at the friendly match between Italy and Argentina. Photograph by Giuseppe “Pino” Fama. All rights reserved, Demotix (August 14, 2013). The World Cup ignites passions and joy in many who watch it. But in Argentina, it isn't just the love of the game that is rustling up all these emotions — star Argentinian player Ezequiel Lavezzi, also know as “Pocho,” generated a shock wave of female fans from the very moment he took his shirt off. Escuchame @PochoLavezzi la próxima salís en pelotas o no entras! 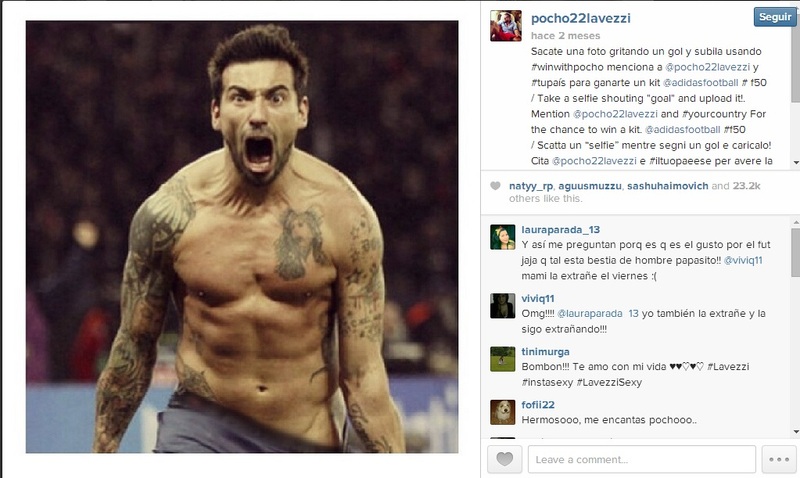 Listen @PochoLavezzi, next time show up naked or not at all! Hola @PochoLavezzi VAMOS A FESTEJAR EN BOLAS!!!! Hello @PochoLavezzi NEXT TIME WE CELEBRATE NAKED!!! “Pocho Lavezzi mimicked Sabella's fall and had his teammates laughing!” I'm not just hot for him, this is LOVE. Y ni hablar del mal gusto de “si el Pocho me mira, ¿sabés cómo largo al gordo?”, “mi marido tiene la misma plancha de ravioles (por los abdominales marcados) pero adentro”. […] Ya sabemos que somos menos deseados que el Pocho Lavezzi. Pero no hace falta que lo digan tan seguido, en voz tan alta y de manera tan grosera. […] We already know we are less desired than Pocho Lavezzi. But, it's not necessary to bring it up so often, and say it so loudly and so bluntly. Ojo, tienen razón, la cosificación es degradante sea cual sea el género. Pero pregunto: ¿cuántos de ellos, cuando sus amigos, familiares, colegas, cosificaban a mujeres, les dijeron lo mismo y les explicaron, como ahora explican a las mujeres Lavezzi-maniáticas, que cosificar es degradante? How hypocritical of men to be shocked because women are staring at the players abs and pecs as opposed to watching their athletic performance! How cynical of those individuals to bring up women's double standards, such as: “Wasn't it wrong to objectify women? Why are you now doing the same thing?” Listen here, that's correct, objectification is degrading no matter the gender. But I ask this: how many of those same men, brought up the topic and clearly explained to their friends, family members, and colleagues, that objectifying women is wrong, in the same manner that it is being presented to women obsessed with Lavezzi today?